Washington Square Press, 9780671745240, 288pp. Meet the denizens of New York City: artists, prostitutes, saints, and seers. All are aspiring toward either fame or oblivion, and hoping for love and acceptance. Instead they find high rents, faithless partners, and dead-end careers. But between the disappointments come snatches of self-awareness, and a strange beauty in their encounters with one another. 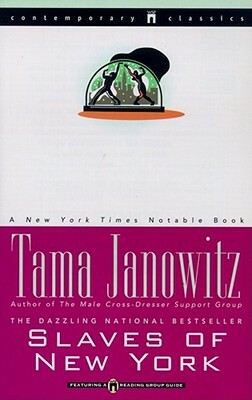 Tama Janowitz vaulted to literary stardom with the bestselling Slaves of New York, becoming "the Most Talked About Writer of the Year" (Women's Wear Daily). Her stories have appeared in such diverse magazines as The New Yorker, Paris Review, Spin, Bomb, and Interview. She is also the author of the outrageous novels A Cannibal in Manhattan and The Male Cross-Dresser Support Group, available from Washington Square Press, and an earlier novel, American Dad. She lives in New York City. San Francisco Chronicle A TRUE ORIGINAL with an eye for quirky detail... Janowitz's lean, satirical vignettes put her in the stylistic company of Fran Lebowitz and Jay McInerney. The Washington Post Sparkling and zippy, from a loft warming to the cast party for a zombie movie...FUNNY, REFLECTIVE...WONDERFULLY SHARP. New York Newsday Jane Austen goes punk....Welcome to bohemia, circa now. Andy Warhol GREAT! SIZZLING! WOW! New York Deadpan wit and drop-dead style...Janowitz is a fearless writer. Vogue Yearning for transcendent love, yet mired in the petulant, niggardly, supremely anti-romantic world of contemporary New York City...In Tama Janowitz's short stories, economics and romance make strange (and funny) bedfellows.